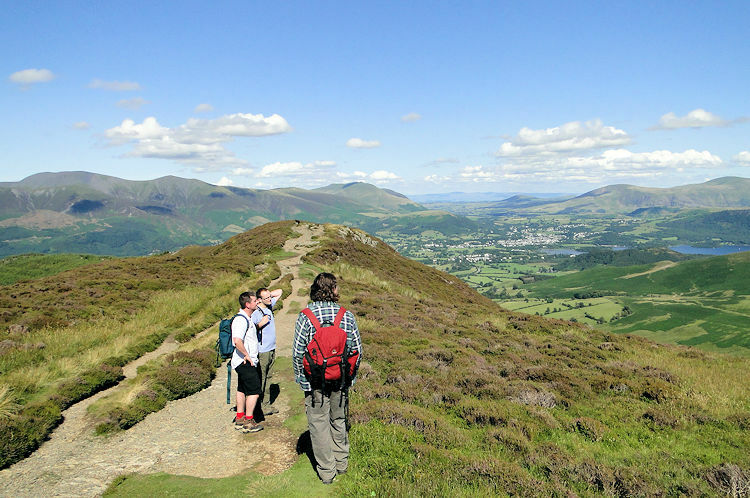 Summary: The Coledale Hoseshoe is one the the iconic Lake District walking routes with a range of marvellous mountains within easy access from the village of Braithwaite. There is no definitive path as options are available from the start. The question is which mountains to do and which to leave until next time? For real toughies it is possible to do 10 or 11 Wainwright Fells in one go but for us mere mortals 5 was enough which left others available for a return visit. Our route was from Braithwaite to Sail then Crag Hill before venturing to Grasmoor which afforded great views of the Scafell range. 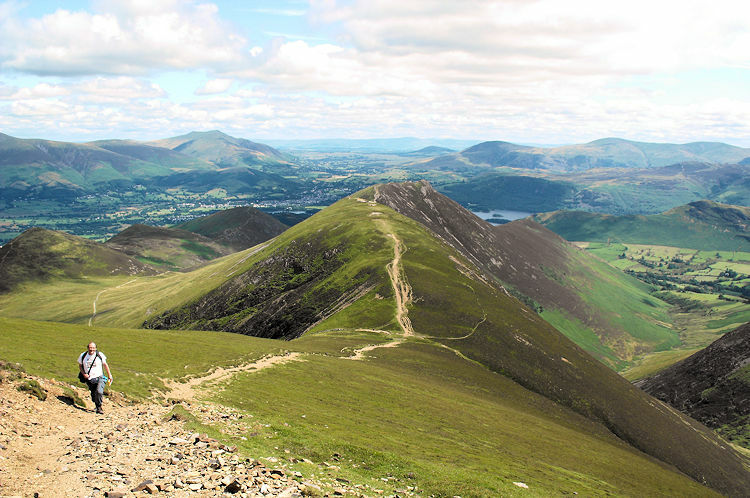 From Grasmoor we headed back via Hopegill Head and Grisedale Pike to complete a memorable walk. The not so famous five who had completed the Helvellyn walk yesterday had grown into the less than magnificent seven overnight as young outriders Greg and Martin joined us for an epic day out. 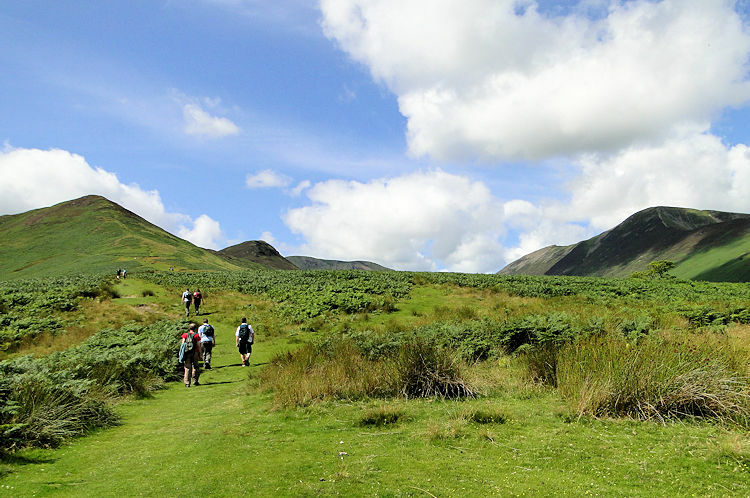 The Coledale Horseshoe was our mission, the walk being one I had wanted to do ever since walking the neighbouring Newlands Horseshoe four years previous. 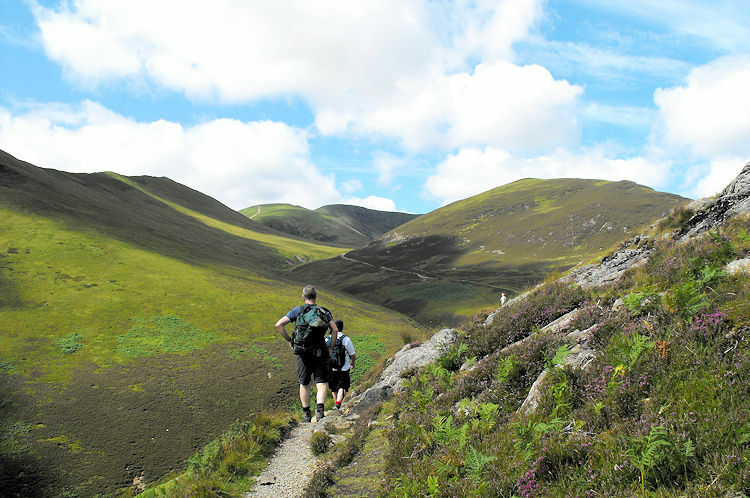 Now was the day of realisation and remarkably the weather had calmed down into a balmy sunny summer's day; exactly as it had done when Steve and I had done the Newlands walk those few years ago. Now, back to the walk, let's set off. We parked up in Braithwaite and left to ascend steadily along a metalled road to High Coledale. The climbing was soon bringing out the beer from the night out in Penrith and as we climbed I constantly wiped the sweat from my brow. 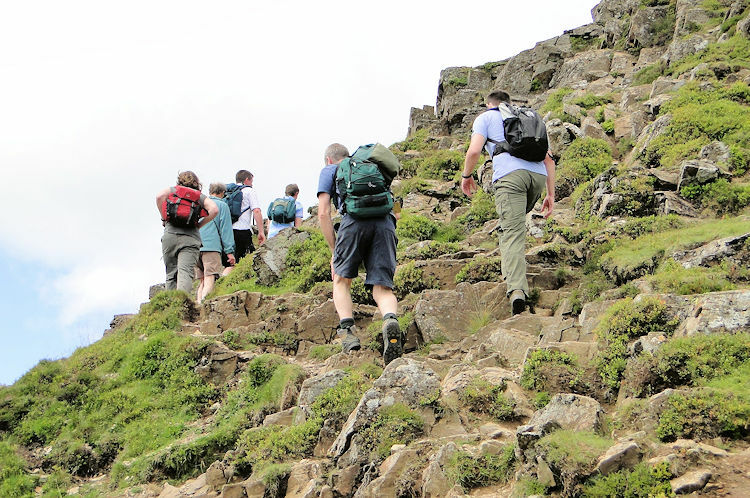 It was warm going as we climbed 130 metres in the first kilometer and then 160 metres in the second kilometer which took us to Barrow Door just below the summit of Stile End. It was at Barrow Door that something remarkable happened, something my colleagues and I will never forget. As we paused for a rest a dog approached us. We presumed it was with a couple sitting by the path who we had just passed. Not so. 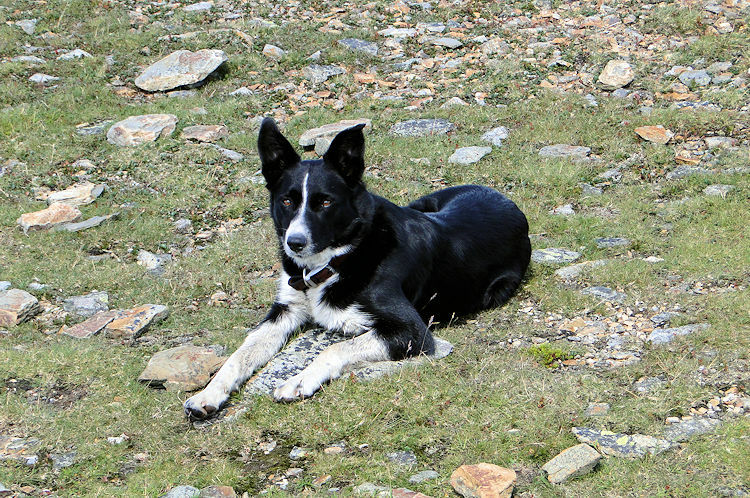 After acknowledging the friendly dog we continued our climb onto the higher ground surrounding Coledale. This took us from Barrow Door at 380m to High Moss flanking Outerside at 500m and then more steeply past Long Comb to a junction of paths near Scar Crags. At the junction we sat down for our first refreshment break. During the walk from Barrow Door the dog had led us precisely. He kept about 100 metres ahead but always stopped to look back, checking on our progress. During our break the dog joined us, sitting amidst us quietly. We sat for a good 10 minutes soaking in the glorious sunshine with Sail, our first Wainwright Fell of the day 500 metres in distance and 140 further meters in height in view to the west. As we rose to make the climb so did our new companion. He continued ahead of us to lead us to the summit of Sail. On cresting Sail and without a thought our guide dog led us on to Crag Hill (alternative Eel Crag) via the Scar which demanded a little easy scrambling. The good Samaritan guide dog had adopted us for the day. Supposedly he could have picked any group to adopt, we were the lucky ones. Again on the summit of Crag Hill we rested and reviewed the rest of the walk. We were at height now and an additional mountain I had considered was beckoning us across an inviting lush grass plateau. The alternative was Grasmoor. The walk to Grasmoor was sublime, a very easy elevated walk on very easy undulating ground with lush grass everywhere and never boggy. It was delightful and the summit cairn drew us all towards it promising fantastic views from its western flank to Loweswater, Crummock Water and Buttermere. Inevitably our dog friend led the way and when we reached the summit the promised views were every bit as good as we had imagined. 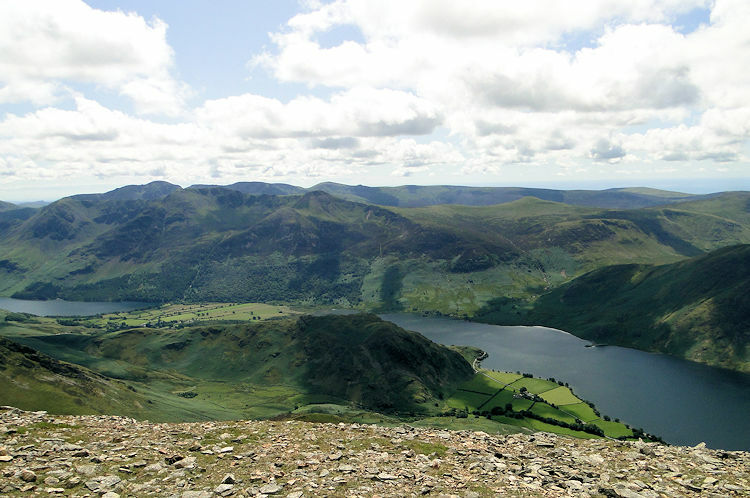 Apart from the lakes below there were superb views across the top of the Scafell range to the south, a view so magnificent that Wainwright drew a rare two page sketch of the panorama as part of his Grasmoor description in book 6 (The North Western Fells) of his pictorial guides. Wainwright went further than is usual in his reflections about Grasmoor by including another sketch of the view to High Stile and Red Pike in the south east with himself dressed in Harris Tweed enjoying the view. He was clearly impressed by Grasmoor and so were we. We stayed on the mountain for quite some time. Our good Samaritan companion took a well earned rest too. 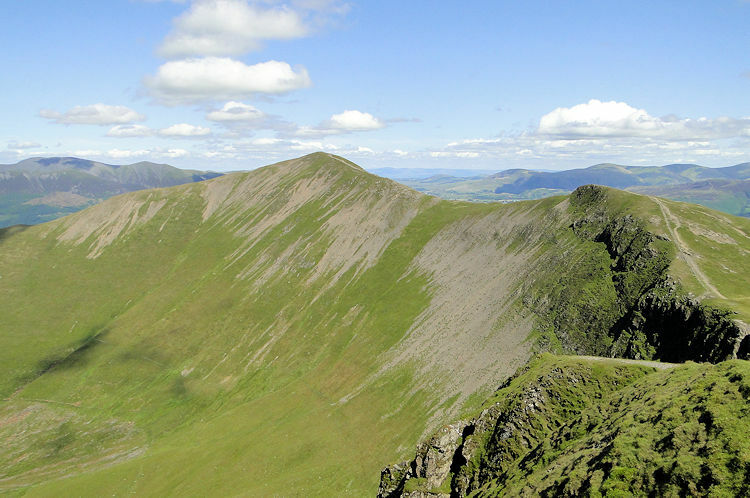 The journey from Grasmoor back to the Coledale Horseshoe route was brilliant with breathtaking views to Dove Crags on the north-east face of Grasmoor and of Gasgale Crags on the southern flank of Whiteside to be enjoyed. 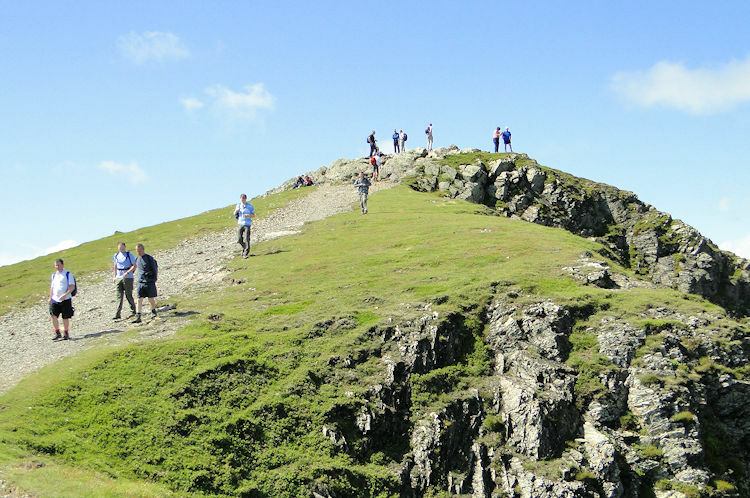 Coupled with the exhilarating feeling walking close to Dove Crags, almost to the feeling of being able to touch them made for a unforgettable section of the walk. 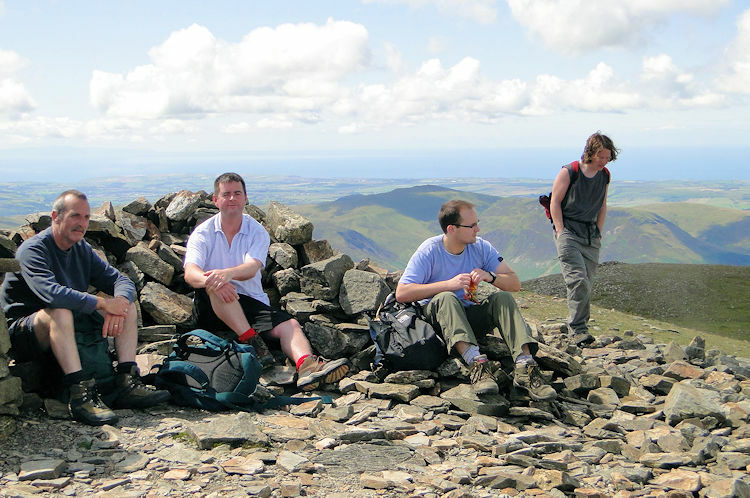 I was in particular high spirits as we all bounded off Grasmoor towards Coledale Hause. 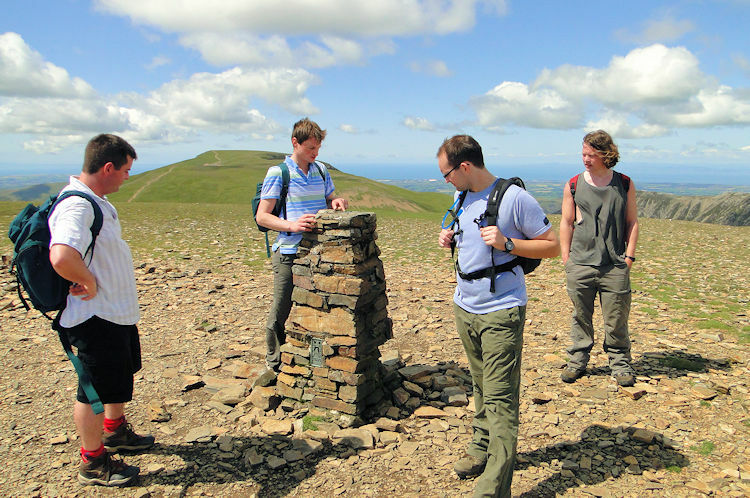 Three new Wainwright Fells had been bagged, new paths had been walked and new views seen. The day had been excellent already and there was more to come. Soon I was second only to our relentless guide dog, leading the rest of the group up Sand Hill with extraordinary vigour which got me to within 50 metres of the top before pausing, photography and breathlessness allowed the rest of the gang to catch me up. Then we stepped up to the summit of Sand Hill together which gave us first sight of Hopegill Head (also known as Hobcarton Pike) just 350 metres beyond due north. 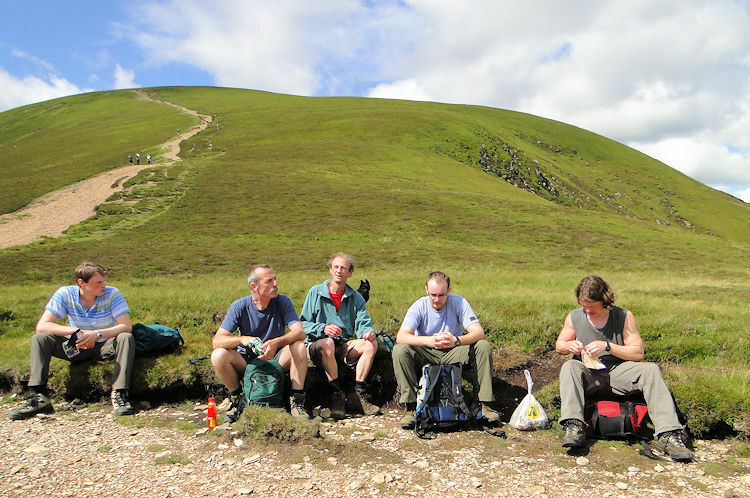 We all strode out to the rocky summit where other walkers we taking rest. 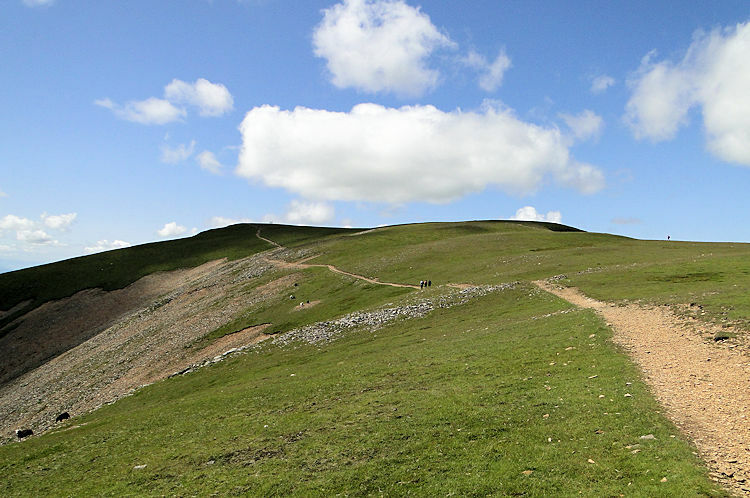 Hopegill Head is a natural crossroads of fell paths, a convenient spot for a break. We took another one here and I made sure our guide dog was rewarded with a sandwich which was deposited immediately. As with our other breaks we soaked in the fantastic sunshine. A terrific day for fell walking. 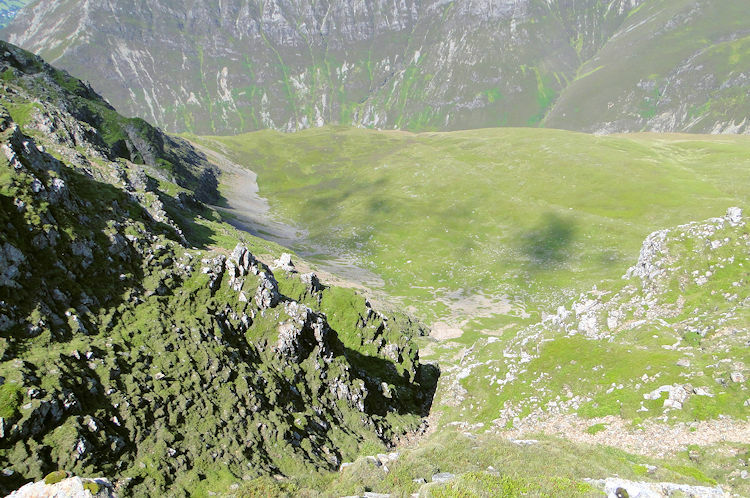 We were entering the final ascent of the walk but not before descending from Hopegill Head past the precarious edge of Hobcarton Crag which we kept safely to our left. 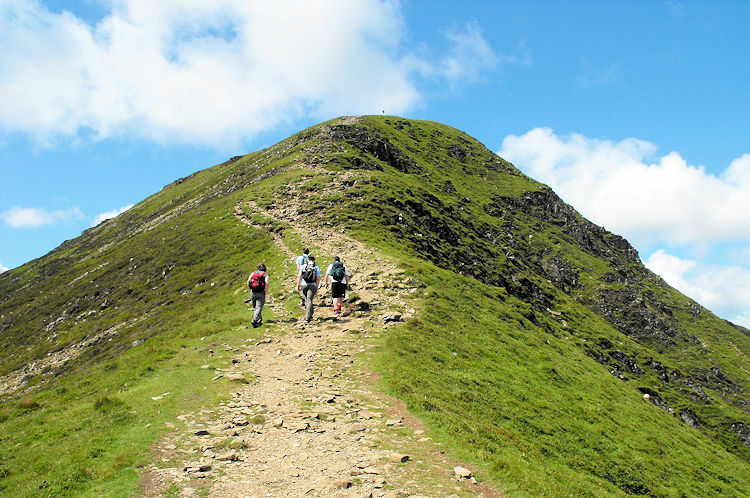 After passing the crag edge we made our final ascent up the natural ridge to Grisedale Pike, our final Wainwright Fell. After a steady and final climb of the walk to the top of Grisedale Pike we took one last timeout and it was during this final sit down that another unusual event happened. As we had reached the top we passed a few walkers also resting. Taking our rest out of their way one couple came to join us and sit. On doing so one asked "Are you the Walking Englishman?" Of course I told him I was and then he went on to give me a complimentary thank you for the work I do on the website. I was flattered. He told me he was from Hull and that he read all my work. Whoever you were, thank you so much. 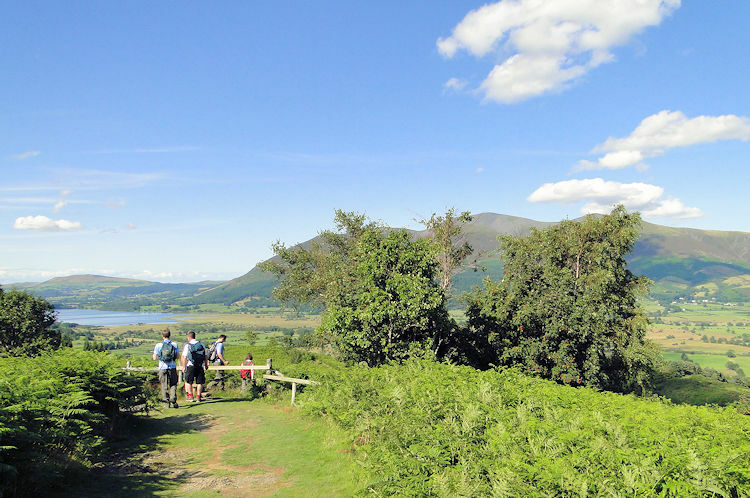 After the welcome encounter our guide dog led us from Grisedale Pike down the falling ridge past Sleet How all the way back to the fern and tree line and then to the Whinlatter Pass road and back into Braithwaite. The super friendly dog knew we were safely back so without fuss left us to presumably return home. We all hoped so. 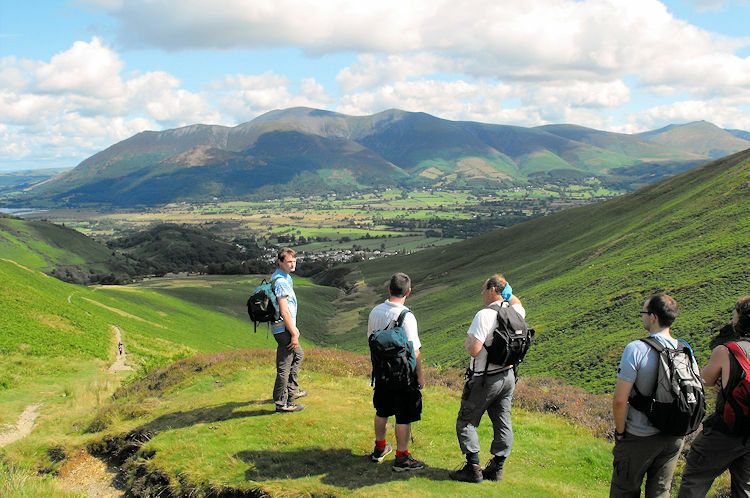 We all immense fun on the Coledale Horseshoe with spectacular highlights throughout, a worthy Lake District classic. And above all we got the bonus of a special guide! 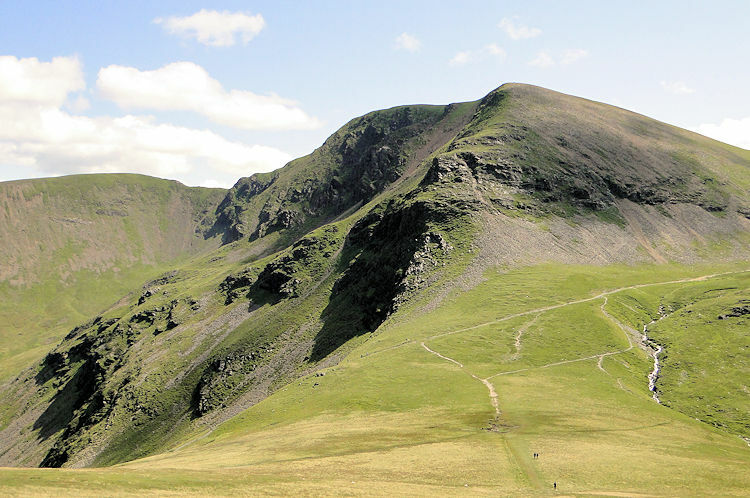 The Coledale Horseshoe was walk 3 out of 4 during our Lakeland 2009 walking trip. Would this beautiful weather hold out for our finale on High Street?